Reach trucks were introduced in the industry with the purpose to reduce aisle widths and therefore allow companies to increase the number of aisles and racking spaces available to them. If you are wondering either to buy or hire a reach truck, here you will find some important information that will help you in understanding their specific application. Reach truck is an efficient piece of equipment designed to operate at narrow aisle warehousing spaces. It is provided with two outer legs that distribute the load weight. The drive wheels is located under the operator’s seating position. The operator sits sideways when operating the equipment. When compared to a normal counter-balance forklift, the wheel base of a reach truck presents the same length, but its body is more compact. Also a reach truck is able to work in much narrow aisles. That because, when lifting a load, it moves the load back within the wheelbase, meaning less of the load is protruding from it. Pantograph Reach Trucks: Designed with a scissor reach mechanism to extend the lifting forks forward, this model allows reach into racking with either a double or a single reach configuration design. It also have a higher lifting capacity when fully extended at double deep reaching. 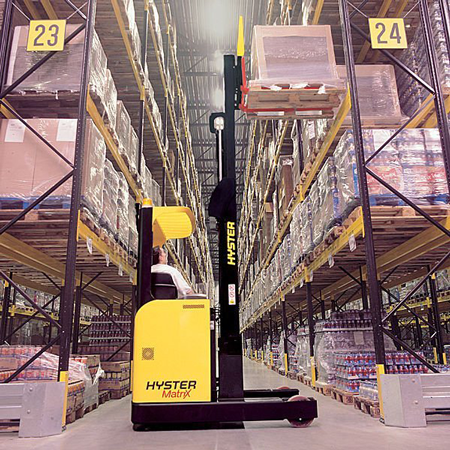 Moving Mast Reach Trucks: Provided with a hydraulic system and based on rails that allow the entire mast to move forward, these forklifts are unable to handle double deep racking without a fork extension attachment. Reach Straddle Trucks: An uncommon configuration of either types. On this model the legs are set apart wider so the unit legs can surround the pallet. Reach straddle trucks is not recommended because they cannot be as closely stacked resulting in increased required storage space. Choosing the right reach truck for your specif application can be complicated and a hard task. Visit your local dealer to meet an experienced professional who will be able to guide your through the process and ensure that you will get the best configuration for your specific application needs.